Thanks to Jonathan of Robbin’s Realm for this recommendation. Brief Synopsis – Documentary that shows many of the famed Prophet Nostradamus’ predictions that he foretold years (even centuries) before they actually occurred. My Take on it – I have heard about Nostradamus’ many prophecies as a teen and even recall that some predicted that Saddam Hussein was a big part of it because he wore a blue beret. This along with some other future prophecies mentioned here didn’t come true in the end and that fact actually takes away from the impact of this film because the predictions were incorrect. The past and present predictions on the other hand are very interesting to watch and hear the interpretations of his writings. Napoleon, Hitler, Lincoln, Kennedy, WWII, The French Revolution and numerous other world events were predicted by Nostradamus centuries after his death. It’s obviously much easier to explain past predictions because you know what to look for and how to interpret them to meet the audiences’ expectations. Im not saying that I think all of his predictions are purely made up but it’s easier to see things when looking at the past instead of the future. I found it quite fascinating that Orson Welles was chosen as the host of this film because even his booming screen presence makes one think of supernatural things and goes along nicely with the whole theme of the film. I wonder what kind of other future or even past predictions would be featured if this was made today. Bottom Line – Interesting documentary that loses a bit of its impact due to some incorrect future predictions. Was fun to see some of the past ones that did happen and learn based on what he wrote about each of those predictions. Welles was the perfect choice to host this because he was always known as a mysterious man who fits in perfectly with the themes presented here. 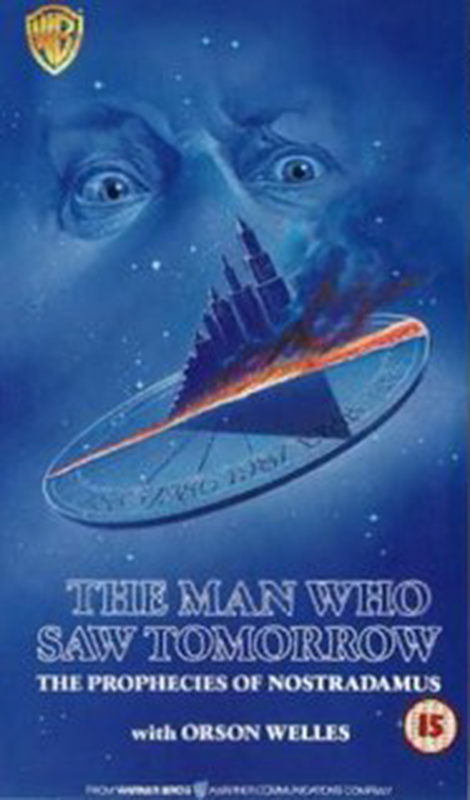 I did an article on my own blog about this film (https://seanmunger.com/2013/09/27/the-man-who-saw-tomorrow-the-movie-that-ruined-nostradamus/) although admittedly it focused more on the history of who Nostradamus was and why his “predictions” were completely ridiculous. Incidentally Welles himself, who did the movie strictly for the money, denounced it. Funnily enough, this article earned me one of my most-ever hostile blog comments, which I didn’t approve, from an angry reader who called me “narrow-minded and stupid” for not believing Nostradamus’s predictions and predicting that I would pay for my intransigence in the fires of hell once the book of Revelations came true. Therefore this counts as one of the more infamous movie reviews on my blog!